It's been raining here. Morning was damp and cold. 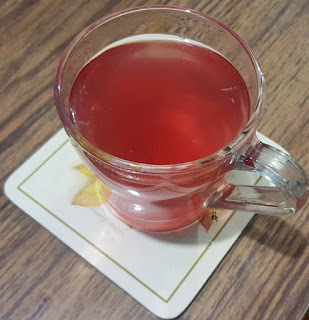 We brewed some Pink tea to keep us warm. The Pink color came from infusing organically grown hibiscus flowers from our garden; we discarded the flowers' Stigma. This hot tea was served with a little lemon juice and organic honey. Word of caution: Please check with your doctor, before consuming herbal teas.